Once Upon A Time characters continue the long journey of making terrible life choices — but Hot Damn, I love Snow White, Aurora, Mulan and Emma hiking through the wilderness. How excellent would Once be if it was just a bunch of princesses hanging out, getting a little drunk and kissing sometimes? When the exasperated Mulan throws her hands into the air and exclaims, "another journey! ", I was right there with her. What is with these people and quests? Golden Compass, magic amulet to protect you from the Netherworld, and now magic ink to stun Cora... good grief. It's become so tedious the show has to reintroduce the Charming and Snow "so close and yet so far" love struggle to get me excited again. All these quests are just so silly, because I'm quite excited about these new characters. I like Hook's eyelashes, and watching Rumps on a date with Belle (how cute was that). 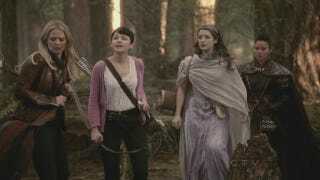 I wish we could spend just a wee bit more time hanging around the campfire with the four ladies in the woods, and less time chasing after Cora. I'm over Cora. But alas, Cora is this season's Big Bad, so we're stuck with that for now. And in this episode, Cora has ZOMBIES! Did I say good grief already? Cora and her army of heart zombies kidnap Aurora, revealing Mulan's true feelings for the sleepy princess. Cora demands the Golden Compass in exchange for Aurora's hide — this seems like the classic bait and switch villain plot, but it's really much more silly than that. 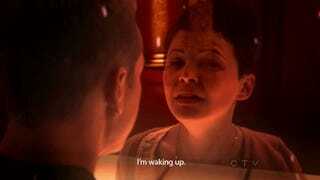 Hook shows up and releases Aurora but first takes her heart and gives it to Cora as penance for his earlier betrayal. Now Cora controls Aurora via heart transmission — really, having a heart in your possession is pretty useful. The biggest lesson we learned from this kidnapping plot is that Hook and his Maybe it's Maybelline lashes are capable of stealing human hearts. Which is exceptionally creepy. Not sure how this impacts all you Hook-Swan shippers... but if Hook is going to continue Kali-maing all the ladies of fantasy land, he's going to lose some love from me. Meanwhile, Henry is still trying to contact Aurora via the dream Netherworld. So far it's not going as planned, so Charming has a GREAT idea. He will poison himself with a sleeping curse so he can go in and see Snow himself. Great idea, buddy! Nothing bad will happen there, that's for sure! And as we all predicted, Snow and Charming have a very sad hello and goodbye in the fire room. Which... the lay-out of the Netherworld is confusing to me — and what was with that moaning? Who is that? What was that strange tornado? Are we just going to ignore that? Who will Charming talk to? But by the end of the episode, Snow and Charming are doing what they do best, and making my eyes leak. These damn kids, I just can't stop rooting for their pure, unfiltered love-fest. Watching these two pine for each other is the emotional equivalent of the puppy-cam. It's just good cuddles. And that's a wrap! We're pretty much right where we left off last week, but now Cora controls Aurora's heart, which could be a pretty excellent set up for a Mulan-Aurora weep-fest.